In a large pot bring water to a boil. Peel and chop sweet potatoes into chunks and add to boiling water. Cook until a fork goes through, maybe even falls apart. Drain water and mash with potato masher, ricer, whatever you have on hand. Add butter, OJ and brown sugar and mix altogether. Pour into baking dish, cover and refrigerate over night. (can also be served right away) When ready to bake, allow dish to come to room temperature, and re-heat the potatoes in a 375 degree oven. 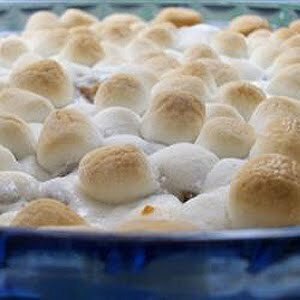 Once heated add marshmallows and cook until marshmallow melt and turn slightly brown. Previous post: In Need of Turkey Tips?